"Change Your Mind... Change Your Heart... Lose Weight for LIFE!" is the mantra of the Healthy Carb Cookbook for Dummies® by health advocate and food writer, Jan McCracken. Tucked between pages filled with Jan's humor, you'll get a mini-course on the glycemic index, glycemic load and why they're so important; why calories "still" count; how to keep your metabolic fires burning for health; and, easy to digest nutritional facts of living a healthy lifestyle. Jan takes you shopping aisle by aisle at the grocery store, guiding you in the right direction for continuing to develop a healthy lifestyle for LIFE! She gives you the no-no's of prepared foods and how to find hidden sugars that you may not be aware are lurking to undermine your weight loss and healthy lifestyle. 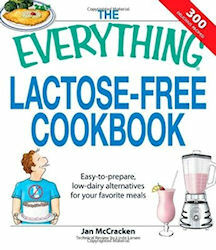 The Everything Lactose-Free Cookbook offers 300 delicious recipes so that people who are lactose intolerant can enjoy their favorite meals again, packed with all readers need to. Book includes how to: use 300 delicious recipes using soy milk, yogurt, cheese and other dairy substitutes; prepare breakfast in a glass, home-made pancake syrups and granola toppings; whip up special coffees and teas; make quick breads, hot and cold soups and delicious pasta dishes; create entrees like mushroom burgers and spicy chicken and mango sauce; cook up cookies, bars & muffins as well as cakes & delightful desserts; and feed lactose intolerant kids food they will love. Complete with nutritional information for each recipe, The Everything Lactose-Free Cookbook also addresses lactose-intolerant kids, discusses alternatives and substitutes for milk and shows readers how to properly read nutritional labels.